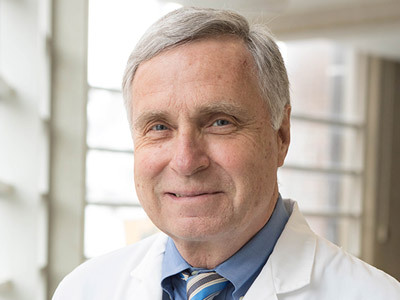 For James R. Parkinson, MD, a lifelong interest in sports and sports medicine not only influenced his decision to specialize in orthopedic surgery, but also his philosophy of care. Born and raised in Amherst, Dr. Parkinson earned his undergraduate degree from Amherst College and went to medical school at the University of Rochester. He completed his residency in Orthopaedic Surgery at Strong Memorial Hospital in Rochester, followed by a fellowship in Orthopaedic Rehabilitation at the University of Southampton General Hospital in the United Kingdom. Dr. Parkinson began practice after his medical training at the former Orthopaedic Associates of Williamstown, working there for 25 years before accepting a position as an Orthopaedic Surgeon at Albany Medical Center, teaching Orthopaedic residents at Albany Medical College. While at the Medical College he was appointed Chief of Orthopaedic Surgery at the Veteran’s Administration Hospital in Albany. During those years, Dr. Parkinson also served as the Medical Director of Sports Medicine and Team Physician at Williams College. Now semi-retired, Dr. Parkinson joined Berkshire Orthopaedic Associates in 2018 and is practicing at BOA’s office at the North Adams Campus of BMC. Using his long experience in Orthopaedics and sports medicine, he is now treating patients with non-surgical techniques, though refers them to his colleagues if surgery is the best option.